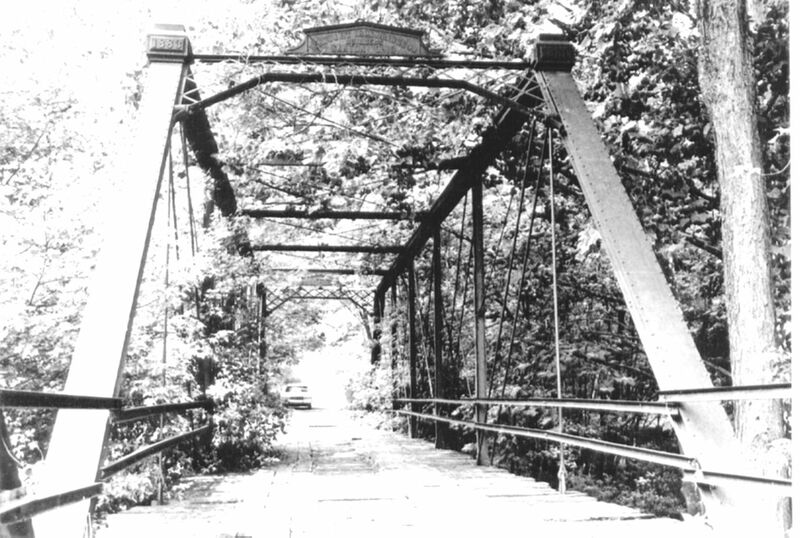 The bridge was once part of IN 22, a primary route that extended from New Albany west to Leavenworth, Fredonia and Princeton. The first survey of the roadway was started in 1827 and a primitive dirt path opened five years later.2 Travel was slow, especially at the crossing for the Blue River that was nothing more than a ford. William Rothrock’s land, requiring a span 120 feet in length, 48 feet high with two abutments at an approximate cost of $5,000. 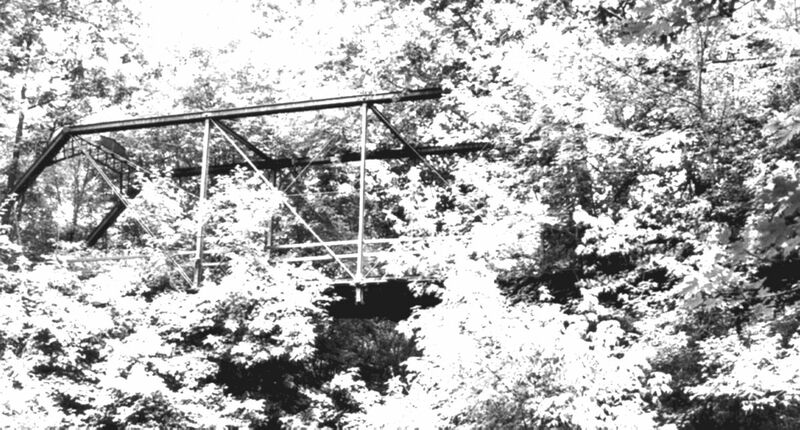 David Cole’s land, requiring a span of 140 feet or 170 feet in length, 55 feet high with two abutments at an approximate cost of $6,500. At a point below Joe Cole’s farm, requiring a span of 125 feet in length, 62 feet high with two abutments at an approximate cost of $6,000. Zebulum Leavenworth’s farm, requiring a span of 120 feet in length with two pillars, 65 feet high with two abutments at an approximate cost of $8,000. 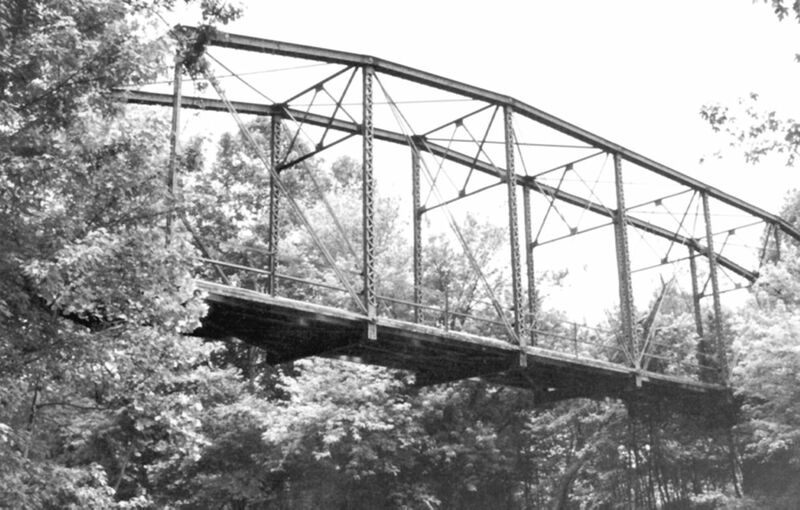 Two others from Harrison County were submitted as well.3 In a meeting in March 1870, the county agreed that a span at Cole’s ford should be built. The new bridge was ordered to be higher than the high water mark of 1832, with a main span length of at least 100 feet and wide enough for two teams of horses to pass. Bids were opened on October 13, and a contract was awarded to the Julius Barbaraux and Company for $9,810, the lowest bidder. A sub-contract for the superstructure was given to the King Bridge Company of Cleveland, Ohio for a wrought iron tubular arch with a main span of 130 feet and a width of 14 feet. The square wrought iron tubular arch was patented by King in 1857, a variant of the bowsting arch that the Wrought Iron Bridge Company of Canton, Ohio had marketed nationwide. The bridge was to be completed prior to October 15, 1871. Smith Bridge Company for $4,155. King Bridge Company for $4,325. Columbus Bridge Company for $4,512. Wrought Iron Bridge Company for $4,223.75. Mars Bridge Company for $4,100. The bids were rejected and re-advertised. 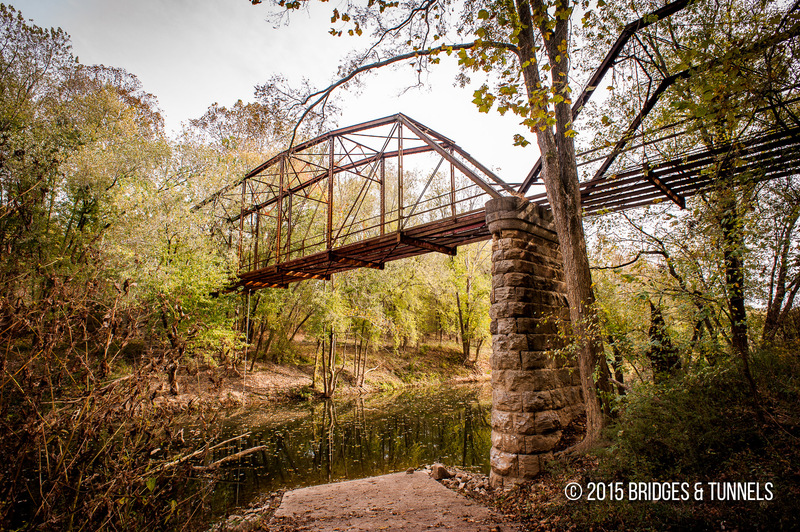 This time, lower bids were submitted and a contract was awarded to the Wrought Iron Bridge Company for $2,549. The repaired bridge was to be completed by September 2, 1883. The new bridge consisted of three spans: a pinned Parker through truss with nine panels measuring 165-feet in length and a two span, seven panel pinned Pratt through truss measuring 125.4-feet. A historic flood in the spring of 1937 devastated nearby Leavenworth. That flood, which consumed towns from stretching from Leavenworth to Mt. Vernon, caused some drastic changes. After the flood, more than $700,000 in federal money was expended to mitigate damage, and of that, $130,000 was used to move Leavenworth out of the floodplain. The new town was dedicated on December 16, 1938 by Col. F.C. Harrington, Governor Clifford Townsend and others. As part of the project, a new IN 22, then numbered IN 62 was constructed east of the town to Corydon due to the Blue River crossing, and to offer a more gentle and modern route east. As of 1984, the bridge was abandoned and its bridge deck removed by 1987 due to structural deterioration. The span is being studied for restoration into a pedestrian path for hikers, horseback riders and bicyclists for O’Bannon Woods State Park as part of the American Discovery Trail. The trail, which exists within the state park and nearby Harrison-Crawford State Forest, will eventually stretch from the Illinois border to the Ohio border. The estimated cost is $250,000, and one donor has already pledged $100,000 towards the effort. 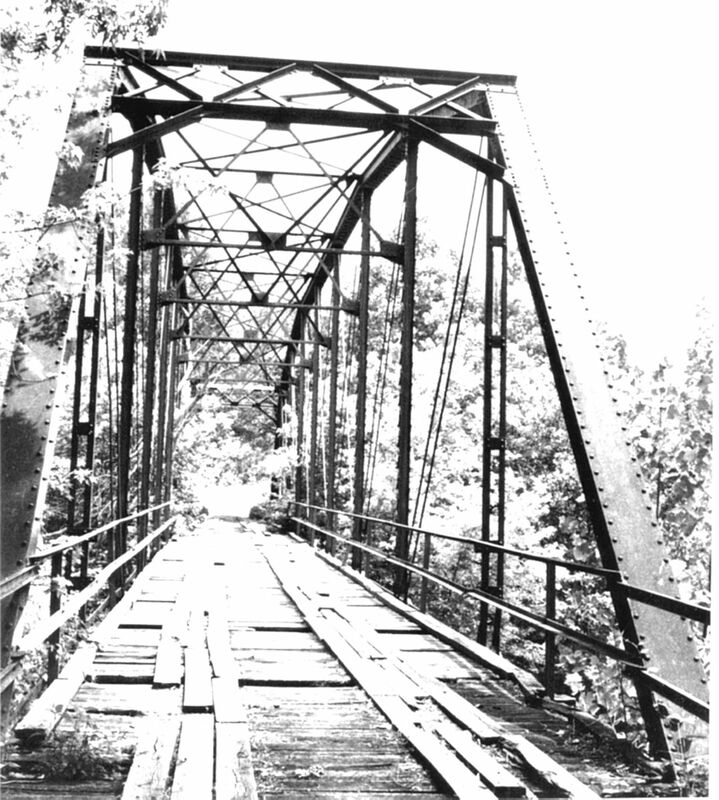 “Harrison County Bridge #76, Crawford County Bridge #40.” State Historic Architectural and Archaeological Research Database. Indiana Department of Natural Resources. Web. 31 Dec. 2015. Pleasant, Hazen Hayes. 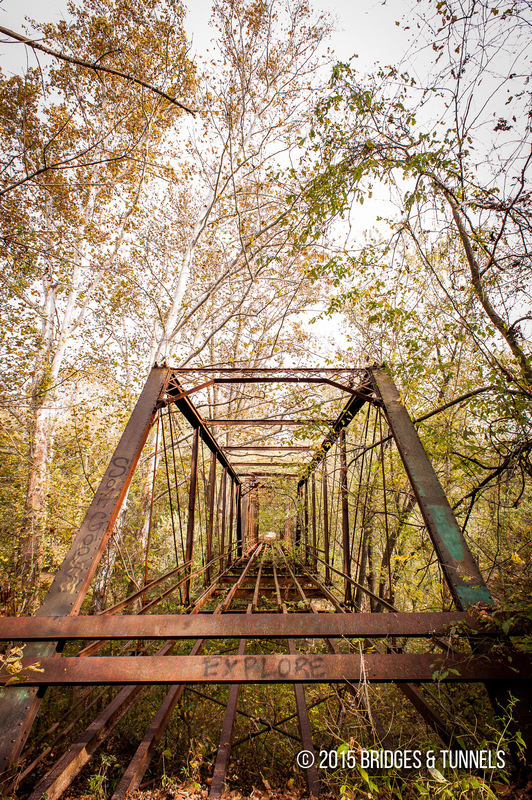 “Early Roads.” A History of Crawford Country, Indiana. Greenfield: WM. Mitchell Printing, 1926. 129-135. Print. Pleasant, Hazen Hayes. “The Seventies.” A History of Crawford Country, Indiana. Greenfield: WM. Mitchell Printing, 1926. 332-337. Print. Pleasant, Hazen Hayes. “The County in the Eighties.” A History of Crawford Country, Indiana. Greenfield: WM. Mitchell Printing, 1926. 353-354. Print. Pleasant, Hazen Hayes. “Marengo After the War.” A History of Crawford Country, Indiana. Greenfield: WM. Mitchell Printing, 1926. 454. Print. Pleasant, Hazen Hayes. “Political Campaigns.” A History of Crawford Country, Indiana. Greenfield: WM. Mitchell Printing, 1926. 575. Print.